Risks are inevitable in your software development lifecycle. Regardless of the specifics of your projects and whether you are using a Waterfall or an Agile method, your team is sure to face some unforeseen or less expected issues during development. Preparing for and managing risks is essential in ensuring your project's success and avoiding overhead. codeBeamer's new and advanced Agile risk management features help you analyze and mitigate your risks. Let us walk you through the basics of risk management, and how to effectively implement a proactive approach to risks in both Agile and Waterfall projects. In the context of software development, we can simply define risk as "uncertainty that matters". This basic definition implicitly refers to the notion of "positive risks": uncertainty isn't necessarily negative, but can also mean opportunities for your team. As a consequence, risks can positively or negatively impact your project. Thus, it is important to plan how your team will mitigate negative risks (threats) and exploit positive risks (opportunities) as they progress along the development lifecycle. This holds true under both Waterfall and Agile development frameworks. The main difference between risk management in these two environments lies in how the steps are implemented. While risk management in a Waterfall project is a planned step of your development lifecycle, it happens in a more subtle and integrated way in the various layers of Agile projects. Risk management starts with planning risks: identifying and analyzing what might happen will help you create a risk registry. Industry-specific checklists can be of great help during the analysis. Set up a risk tracker in codeBeamer to register these risks, allowing access for your entire team. You can also set up associations between risks and requirements, and assign risks to members of your team. After listing and describing all risks in the registry, it's immensely useful to create a risk matrix by assigning two values to each identified risk: probability (likelihood) and impact (severity). Ask your team: "How likely is this risk to occur? What effect will it have on my project?". codeBeamer includes a fully customizable Risk Matrix Diagram that lets you set your own labels, rules and visualization options. Complete flexibility means that you'll be able to tailor the Risk Matrix to the specifics of your project. 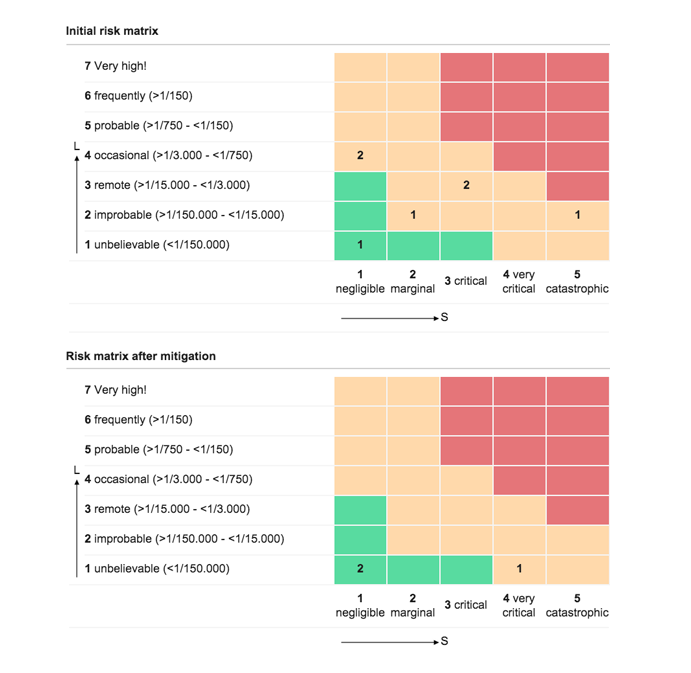 Using codeBeamer's Risk Matrix Diagram, you can visualize all risks before and after mitigation, providing an easy overview of risks to your whole team, whether you are using Waterfall or Agile in your projects. Deciding on how to handle risks that are in the red or yellow sections of your risk diagram lets you address severe issues before they become a problem. In a Waterfall scenario, where you'll be trying to plan risks well ahead of time, your estimation about the likelihood or severity of risks can be inaccurate. With constant changes of requirements in a shifting business environment, it is vital to define roles and responsibilities for continuously monitoring and controlling risks in your Waterfall project. Overlapping stages of development, poor quality assurance, and long processes are all sources of risk in a Waterfall environment. With Agile projects, risk management usually encompasses a shorter timeframe. The risk register is reevaluated at every sprint planning meeting, and risks are discussed during stand-up meetings every day, and during retrospective meetings at the end of each iteration. Simply by using Agile, you can reduce a variety of risks related to budget, time to market, scope creep, requirements and security. However, you'll still need to define a process to manage risks. Related reading: How Does ALM Support Risk Management? After setting a risk priority list, you'll need to decide how to treat those risks: your response strategies with negative risks include avoiding, transferring or mitigating risks, while with positive risks, you can choose to exploit, share or enhance these "upside risks". Make sure you monitor risk mitigation, keeping in mind that you can never entirely eliminate risks, and that the way you treat one risk may actually create new risks. 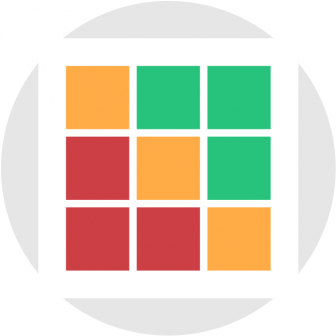 codeBeamer's Risk Matrix Diagram should provide you with an efficient overview on the performance of your risk management lifecycle. codeBeamer also offers full traceability on risk dependencies and changes, and wikis for risk documentation. Proactively managing risks helps you make your projects more effective, can help avoid overhead, and ensure high product quality. Whether you are using a Waterfall or an Agile approach, codeBeamer's powerful risk management features (fully customizable Wikis, risk trackers and a Risk Matrix Diagram) will help you minimize the impact of negative risks, and take advantage of opportunities. Have any questions about managing your risks efficiently with codeBeamer ALM? Drop us a line, or start your free trial to explore codeBeamer ALM yourself.